Well, it’s December 24, Christmas Eve. There hasn’t been a heavy snowfall since the last heavy snowfall. 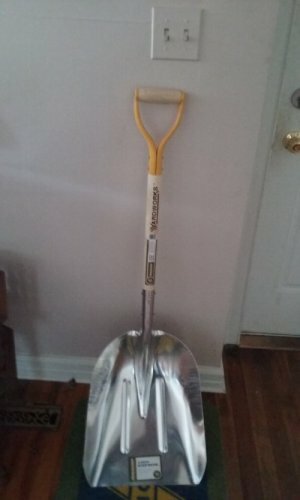 I bought a new snow shovel last week and I’d like to use it. But, instead of snowfall, we’ve been having snowmelt and there’s ice. I’m staying home today. Got beer and pizza. There’s a bunch of Christmas movies on TV. and I might watch a couple. TNT will start running A Christmas Story at 8 PM and looks like it’ll be rolling back-to-back for 24 hours. If you’re someone who has never seen A Christmas Story, you really should check it out. You might hate it, but you might love it. 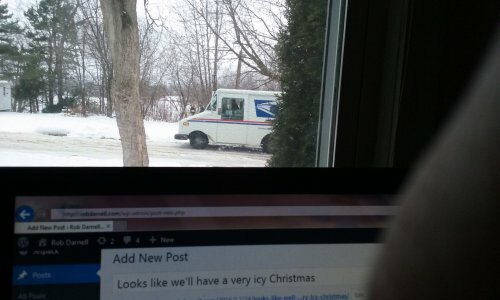 USPS workers don’t get the day off, apparently. Yesterday I blogged about how shootings are often weirdly exaggerated in fiction. That brought to mind another thing I often notice, how landmines function in fiction. If the unlucky soldier is really generous, he’ll stand there until his buddies are a safe distance away, and then he’ll lift his foot. Boom, he’s dead. It’s hard not to think that all the soldier had to do was jump to the ground, cover his head with his arms, and the blast wave might not have done much damage. They jump to the ground when grenades are thrown at them, why can’t they do it when they step on landmines? Research shows that there were times in real wars when landmines did not function properly and you could stand on them without them going off. But a properly functioning landmine will not give a warning. You won’t hear a click. When you step on a landmine, it goes off. You’re not required to lift your foot for it to go off. I think the people who create these scenes know this. They might even know that a 12 gauge and .44 Magnum won’t send a person flying backward in real life. Maybe they put those things in because it makes the scenes more thrilling for people who aren’t obsessed with the details like I am. Personally, I wouldn’t do it that way. I’m overly obsessed with trying to get everything exactly right in my fiction And I’m still afraid that readers of my work will find so many booboos. I keep seeing scenes in stories and movies, where Character A shoots Character B with, say, a .44 Magnum or a 12 gauge shotgun. Character B goes flying through the air until he crashes into the wall behind him. That just doesn’t happen. Not when shot with a .44 Magnum, not when shot with a 12 gauge. Not even a .50 BMG will send Character B flying backward. It’s entirely possible that he wouldn’t even fall down right away. If Character A wanted to make Character B fly backward, he’d probably need to shoot him with a rocket launcher. But then, the rocket would just blow Character B to pieces. The Walking Dead is on break and won’t be back until February. If the Walkers aren’t infesting my TV, they’re infesting my dreams. Since the latest episode, I’ve had two dreams that featured Walkers. Last night, I escaped a town that was overrun by Walkers. I had a bolt-action rifle, but only four bullets. I outran the group of Walkers that was chasing me and found myself in an empty barnyard. Or I thought it was empty. I stepped on a tripwire and Walkers began coming from every direction. I fired my rifle until it was empty and had to use the rifle as a club to fight my way through the herd. I made it through without getting bit, but soon stepped on another tripwire that somehow (I don’t know how) attracted more Walkers. There were too many. They closed in around me and I woke up. I’ve been getting up at 6 AM. I try to have a new blog entry written before seven, but it often takes me longer. And then I work on the novel. If I manage to get ten pages into the novel, I’ll work on a short story and try to get five pages. That doesn’t always mean writing, sometimes it’s editing. I finish my day by reading no less than one chapter of whatever book I happen to be reading. Right now it’s Finding Fish, by Antwone Fisher. I have a checklist on excel, that’s divided into two columns. One column is blog, novel, short story and reading. The other column is chores that I can get up and do if I’m stalled on the stuff in the first column. I don’t always get everything on the list checked off, but I try to. What did the Lions do to the Giants? Yesterday, the Lions managed to get two field goals, while the Giants got one field goal and… two touchdowns. The final score was 6-17 and the Lions are now 9-5. The Lions are still in first place, but they’re now leading the NFC North by only one. The regular season has two games left. Although the Vikings lost yesterday and are no longer a threat, the Packers did not lose. Next week the Lions have the Monday Night Football slot with the Dallas Cowboys. I hate the Cowboys, not as much as I hate the Buckeyes, but still…. The Cowboys are leading the NFC East. They’re currently 12-2. Good Luck against that, Lions. If Stafford and them can beat the Cowboys next Monday, I’d be impressed. But after their loss to the Giants yesterday, I’m preparing for the worst. I shoveled my sidewalk and driveway twice this month. Over the years, anytime I shoveled snow or did any kind of physical work, I’d be coughing and gasping for air. Not anymore. Since I quit smoking in June, I’ve been noticing how much better I feel. I don’t wake up in the morning feeling like I’m suffocating and I can laugh without breaking into terrible coughing fits, and I seem to have more energy. I have not had a single cigarette since June 3rd, when I smoked my last one and announced on Facebook that I was going to quit. I don’t know how I managed to just quit like that. For twenty-three years, I failed, failed and failed again to quit smoking. All of sudden, I’m a non-smoker. How did that happen? Yesterday I announced that I got that novel submitted to a publisher. I don’t know when I’ll hear back from them. Could be weeks, could be months. 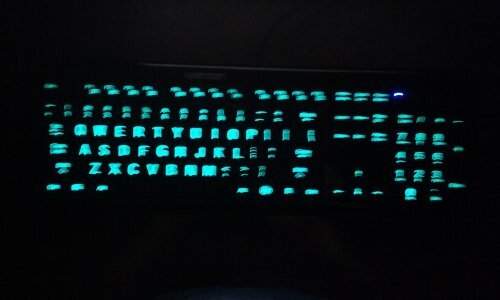 Before starting Book Two of the series, I remembered the new illuminated keyboard I bought a couple weeks ago and decided to hook it up. I have another one of these that I was using until a year or two ago when some of the keys stopped functioning properly. But this new one feels like it’s better made and the letters are bigger. It also has seven different light colors, but I like the white light best. This means I can write in the dark again. It also means I don’t have to strain to see the keys anymore, which I often had to do even when the lights were on. I was never one of those people who can write without looking at the keyboard. So, yesterday, I got 312 words into Book Two. That’s not a bad start. Yesterday was a long day. I spent the entire day putting together a submission package for one of the big publishers. I didn’t think it’d take me till one in the morning to finally submit the thing. Writing a cover letter and synopsis, and all that stuff, is like pulling teeth. It’s not fun at all. The fun part is writing actual fiction. The rest is just agony. I got up from my desk only a few times yesterday. Think I’m going to start Book Two today. I guess my motto is “Let’s see what happens”. I’ll do the best I can with each project, send it out and see what happens. 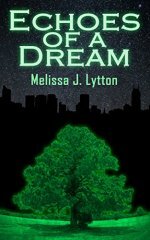 While reading Melissa J. Lytton‘s Echoes of a Dream, I kept thinking that the prose rolls like it does in Walter Mosley’s Devil in a Blue Dress. They’re completely different stories; Mosley’s is a noir set in 1948 Los Angeles and Lytton’s is a science fiction set in the future. But I feel the writing is similiar in that it just takes you in. I don’t think “grabbed me and held me” is the right way to describe it. It’s more like you’re comfortably settled into the story and it’s a smooth ride. Eric Hudd is a drug addict, though he has been clean for some time now. He has a job and his own place, and it seems his life is on a better path. But something is wrong. When Hudd accidentally kills a man, he’s not sure it really happened or not. Soon he finds out that the factory near the building he lives in has something going on that tampers with people’s dreams and realities. Hudd decides it needs to stop. Lytton did an outstanding job creating this novel. Her character development and world building skills are excellent, and she has a keen sense of story.